How to Enjoy Retirement: Are You Preparing Well? Even if you’re young and just starting out in your career, you want to be able to retire sooner rather later. Of course! Who wouldn’t? Here’s the problem: You still need money to live on after you say goodbye to the working world. That’s why it’s so important to think now about what you want to do later. We’re always looking for a quick fix or a magic bullet to become wealthy, but there isn’t one. It’s a matter of setting yourself on solid financial ground and working to make progress over the long haul. Investing isn’t a sprint—it’s a marathon. Before you can enjoy your retirement, you need to get an idea of what you want retirement to look like. That will determine how much money you’ll need. For example, let’s say you want to travel the world. That will require more money than if you wanted to pursue hobbies, right? Knowing which target you’re aiming for will dramatically increase your chances of hitting it! There’s another reason you need to picture how you’ll enjoy retirement: It gives you perspective. Let’s be honest, going to work every day can wear you down—even if you love your job. And there will be days when you’d rather blow all your money on the vacation of a lifetime. I’ve been there. What keeps you on track is knowing that you have a bigger picture in mind. Building wealth takes long-term vision. Give yourself permission to dream—and not in the abstract. Get specific. Want to go to Italy? Start researching travel. Want to explore North America in an RV? Put a picture on your fridge. Visual reminders will help you stay focused. It’s okay to explore your options and have fun—just don’t do anything beforehand that will wreck your plan. You want to reach retirement early, not delay it with five years of stupid. Allow yourself to soak in your vision for a few minutes each morning to keep you focused on your R:IQ. Believe it or not, many people wander in retirement because they don’t have a plan for when they get there. That’s something you’ll never have to face. You’ll be ready! I know, I’m going against the grain of the entire financial world. You’ve probably heard terms like “good debt” or “smart debt.” Let me say this: No debt is ever good! Interest you pay is a penalty, no matter how much you think it’ll help you on taxes or increase your credit score (which is just a scam to keep you in debt). The smart way to live is debt-free. Before you start investing, I want you to pay off all your non-mortgage debt as fast as you can. That’s because debt is quicksand. Once you’re in it, you can’t make any progress forward until you get out. A friend of mine overheard a conversation recently in which a guy said, “Yeah, we bought that ATV for his birthday. We just finished paying off the cabinets, so we figured the ATV payments could replace the cabinet payments.” That’s not okay! You may not be replacing cabinet payments with ATV payments, but you might just be making car payment after car payment! Let me do some quick math with you. Let’s say you spent four years paying off your car at $400 a month. You’d be forking over at least $20,000 ($400 x 48 months + interest). If you’d put that $400 a month into a mutual fund, you could have $24,000 after four years. 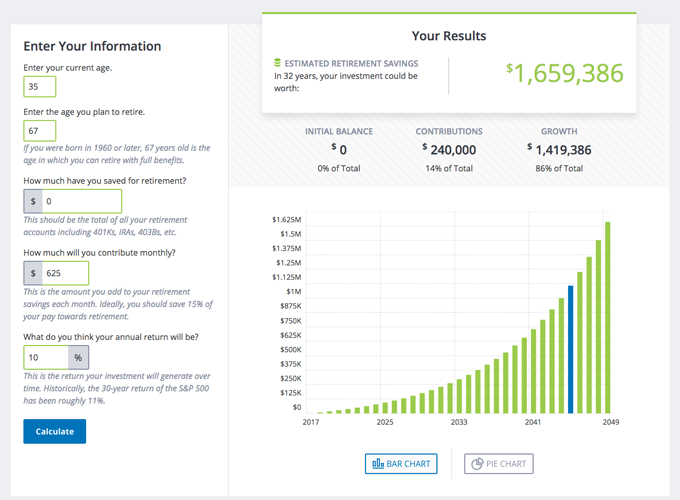 That may not seem like much initially, but if you kept that $24,000 invested from age 35 to age 65, you could have more than $418,000, assuming a 10% return. That $20,000 car cost you $418,000 in retirement money! The lesson is clear: Every penny you’re putting toward debt payments is money you could be investing for the future. Get out of debt and stay away from it. You can’t enjoy retirement with debt. Period. I can’t overemphasize how important it is for you to start investing as soon as you’re out of debt (except for your house). I know you want to enjoy the fruit of your hard work, and that’s okay, but not at the expense of your future. Many people never get started investing for retirement, even though they had planned to. A 2016 Gallup poll reported that just 52% of Americans say they invest in stocks. And of those polled, middle-class adults and those under 35 were the least likely to invest. (1) That might not seem like a big deal, but let’s do the math again because numbers don’t lie. Let’s say you’re 25 years old and make $50,000 a year. If you invest the recommended 15% of your income, you’d put away $625 a month. By the time you reach 67, the current retirement age, you’d have over $4.4 million, assuming a 10% rate of return. However, if you waited until age 35 to start investing, and invested that same amount, you would have $1.6 million. Those 10 years cost you $2.8 million. Why is there such a big difference? Time and compound interest. If you started investing at age 35, you could still hit that $4.4 million-mark, but you’d have to work 10 more years, or until age 77. Those extra 10 years make a huge difference. The earlier you start investing, the earlier you can say goodbye to the working world! When it comes to your finances, you can’t ever go on autopilot. Not now, not in retirement. You need to know where your money is going. There are two ways to do that. First, make and keep a monthly budget. That way, you know your money is going where you want it to go. You control your money—it doesn’t control you! That’s true for every stage in life, even when you reach that million-dollar milestone. The second way to keep track of your finances is by meeting regularly with a financial advisor. That way, you know how your investments are doing and can make adjustments to your portfolio along the way. You’ll also know if you’re ahead or behind of where you want to be. These regular meetings are especially important as you get closer to retirement and you move from a wealth-building approach to a wealth-protecting approach. Talk to your advisor about your retirement income streams to make sure you know exactly how things will work. People who are enjoying retirement now know the value of making sacrifices, investing intentionally, and staying away from stupid choices. The question is, are you willing to do what it takes now so you can enjoy retirement later? For someone who knows what it takes to reach your financial goals, check out a SmartVestor Pro. They can help you create a plan for your retirement.